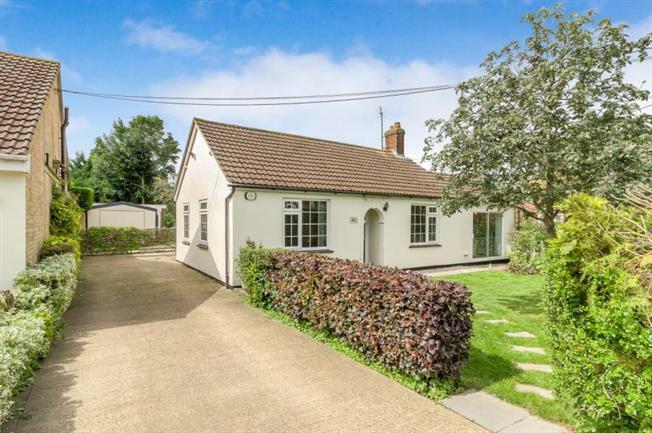 4 Bedroom Detached Bungalow For Sale in Bedford for Offers Over £500,000. Stunning four bedroom detached bungalow in the sought after village of Cranfield, this significantly extended property is in excess of 1900 sq ft and offers a superb level of accommodation, this home has been carefully designed creating a self contained annexe if required or a large bedroom with dressing room. Externally the property has a large garage with two workshops and office area, this facility has been carefully designed to suit a home business, internally the property has a total of five bedrooms, the front of the home hosts three large bedrooms, these rooms are supported with a family bathroom, there is an extensive kitchen with an excellent range of wall and floor mounted units, this rom is supported with a formal dining room with direct access to the large Lounge, this room has a feature fire place and enjoys views over the front garden. There is also a utility and conservatory over looking a paved courtyard area. The rear of the property hosts a side door, large bedroom and recently re fitted dressing room. This aspect of the property also benefits from a family bathroom; there is a back door that could be utilised to a separate self contained annexe if required, there is extensive parking at the property and a lawn garden with further storage area located to the rear of the garden.